Betty Parsons standing in the doorway of her gallery, 196-? / unidentified photographer. Betty Parsons Gallery records and personal papers, Archives of American Art, Smithsonian Institution. As gallery owners, curators, critics and writers, educators, and collectors, American women have made significant contributions to the evolution and public understanding of contemporary and modernist art in our country. The Archives of American Art is fortunate to have the papers of, and oral history interviews with, many of these women among our holdings, all with detailed finding aids available. We’ll be highlighting several of these collections in upcoming blog posts, starting with the Betty Parsons Gallery records and personal papers which were digitized in their entirety as part of the Terra Foundation for American Art Digitization Project. Betty Parsons was one of the leading art dealers in New York City during the late 1940s through the 1950s. 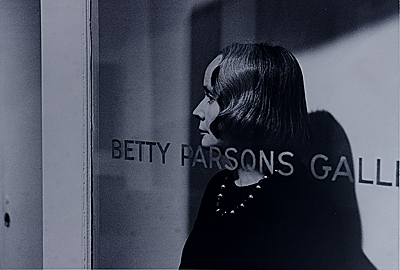 Using $1000 of her own money and an additional borrowed $4000, Parsons opened the Betty Parsons Gallery on the fifth floor of 15 East Fifty-Seventh Street in 1946. By the time she opened her gallery, she was already representing artists from her former position at Mortimer Brandt’s gallery, including Ad Reinhardt, Boris Mango, and Hans Hofmann. 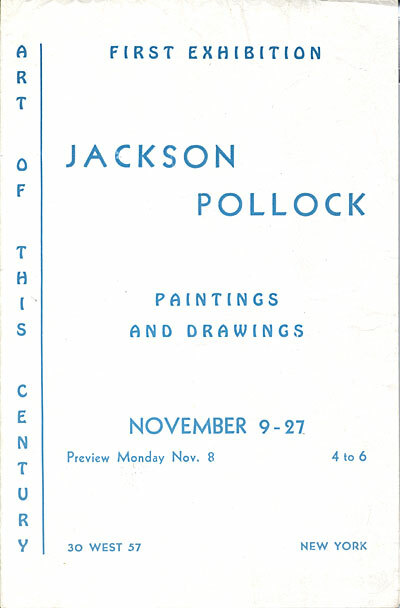 Jackson Pollock paintings and drawings , 1943 Nov. 9-27. Betty Parsons Gallery records and personal papers, Archives of American Art, Smithsonian Institution. Peggy Guggenheim, New York, N.Y. letter to Betty Parsons, New York, N.Y., 1947 May 5. Betty Parsons Gallery records and personal papers, Archives of American Art, Smithsonian Institution. When Peggy Guggenheim closed her New York Art of This Century Gallery in 1947 to return to Europe, some of Guggenheim’s artists agreed to join Parson’ s growing stable of modern American artists, notably Jackson Pollock—whose move to the Betty Parsons Gallery is confirmed in this 1947 letter from Peggy Guggenheim—Clyfford Still, and Mark Rothko. Along with Barnett Newman, they dominated this period and worked closely together. They were actively involved in the curatorial process and often hung their own shows. For these artists, the exhibition itself was an artistic act of creation. Exhibition checklist, 1951 May 14. Betty Parsons Gallery records and personal papers, Archives of American Art, Smithsonian Institution. Although many of her early artists moved on to other galleries, Parsons continued to create a haven for the young avant–garde. Ellsworth Kelly, Richard Tuttle, Robert Rauschenberg, and Jack Youngerman had their first New York exhibitions at the Betty Parsons Gallery. Amongst the Gallery records is an annotated list of seventeen works included in the Paintings by Bob Rauschenberg exhibition in New York, May 14–June 2, 1951. After thirty-five years at the gallery, Parsons closed it in 1981 and retired. She died in New York City one year later. Barbara Aikens is the Chief of Collections Processing at the Archives of American Art. Women are often the driving force in art and style. Her love of art really showed through her gallery.